This unique collection of metallic colored mugs and cups features the look of shiny, polished steel. 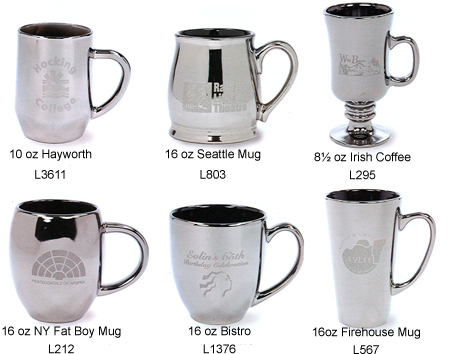 Choose from 12 different mug styles, including our popular 8½ oz. Irish Coffee Mug, our 16 oz. NY Fat Boy Mug, and many more. Perfect for promotions and special events, these attention-grabbing mugs are sure to be a hit. L361 10 oz Hayworth Mug 5.39 4.94 4.76 4.58 4.49 2" 2¼" 7½"
L803 16 oz Seatle Mug 5.88 5.22 4.94 4.80 4.67 1¼" 2-5/8" 8-3/8"
L295 8½ oz Irish Coffee 6.02 5.66 5.48 5.39 5.30 2¼" 2" 6"
L212 16 oz NY Fat Boy Mug 5.88 5.22 4.94 4.80 4.67 1½" 3-5/8" 9-7/8"
L1376 16 oz Bistro Mug 5.39 4.94 4.76 4.58 4.49 1-7/8" 3" 8½"
L567 16 oz Firehouse Mug 5.57 5.12 4.94 4.76 4.67 3" 2-1/8" 6-7/8"
L601 11 oz Ceramic Mug 5.39 4.94 4.76 4.58 4.49 2½" 2-7/8" 8"
L608 13½ oz Corporate Mug 6.02 5.57 5.39 5.30 5.21 1½" 2½" 8-1/8"
L5407 15½ oz Corvino Mug 6.04 5.35 5.04 4.90 4.76 2¼" 2-5/8" 7-7/8"
L011 15 oz Tankard 5.48 5.03 4.85 4.67 4.58 3-3/8" 2-5/8" 7"
L273 12½ oz Tankard 5.39 4.94 4.76 4.58 4.49 2½" 2-7/8" 8"
L027 15 oz Maritime Mug 5.57 5.12 4.94 4.68 4.67 1-7/8" 2-7/8" 8"
It's easy to have your own Custom Lusterware Mugs, simply call 1-800-233-0828 and submit your camera-ready artwork to graphics@kardwell.com (you can also mail or fax your art). 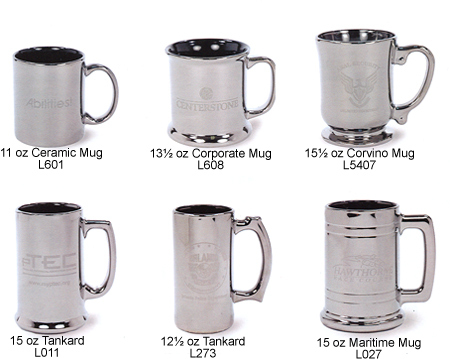 The minimum order is just 72 custom imprinted mugs. You will receive your promotional mugs in about 3 to 4 weeks. Rush delivery is available.